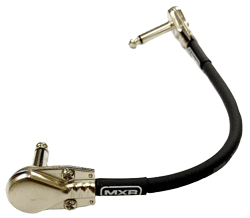 We’ve all seen them – the fixed pedal couplers that you can use to connect pedals. They come in two varieties, either straight (pictured to the right) or offset (pictured below). Obviously, as it is a solid connector it must be a better connection than using two plugs and a cable, right? Well, no. Take a close look at the coupler – you’ll see that it is perfectly straight. Even with the offset type, the two plugs are straight in relation to each other. Now look closely at your pedals. If you measure their width at the top and at the base, you’ll probably find them to be slightly wider at the base. This means that the side walls on most pedals are not perfectly vertical, but rather leaning slightly inwards, in turn making the plug point slightly upwards. Can you see the arc starting to form? Here I hooked up an Ibanez PT-9 and TS-9 using a straight coupler, and an MXR Dynacomp using an offset (to get them to the same height). If you were to place that combination of pedals on a pedalboard, with velcro securing the pedals to the board, that angle will have to be taken up by the jacks. And even without securing them to a pedalboard, simply placing them on the floor is a hazard for the jacks – each time you step on one of the outer pedals to turn it on/off, you’ll be putting quite a lot of strain on the jacks. Does this affect all pedals? Boss pedals have the straightest side walls that I’m aware of, but even with those there is a slight lean. Ibanez 7 series pedals are also very straight, but of course in those the jacks aren’t mounted to the box at all, so any strain caused by other pedals’ jacks sitting at a slight angle can lead to the jacks coming loose from the circuit board they’re soldered to. And even if you have two pedals with perfectly straight/vertical side walls, simply stepping on one of them will compress the rubber feet slightly, again putting stress on the jacks. So the answer is yes, even though it’s not as bad with some.